I'm getting many visits, but few comments. If you have something to add, or believe I am in err, please click on "comments" at the end of the article and write your opinion. If for some reason this is not working, please let me know. Back in 1997 Adrian Goldsworthy wrote a paper (War in History 4:1 1-26) against the literal interpretation of the othismos as a "gigantic pushing match". Before I critique this paper, I want to say that it was very good work. Looking to battlefield universals like morale and understanding the psychology of men in combat was an admirable way of overcoming the fact that much of our evidence, literal and pictorial, can be interpreted in a contradictory manner. In this paper he does not provide new evidence directly against the othismos-as-scrum beyond what was espoused by Cawkwell, Krentz and others. What he does instead is present two quite compelling alternate explanations for why men would fight in deeply massed ranks if not to add their physical weight to the phalanx's pushing power. For the first explanation he follows Keegan's lead and examines the role of the rear ranks of a deep phalanx in preventing the the front ranks, the only ones fighting in his spear-fencing only scheme, from breaking away from combat. This idea is undoubtedly correct: men in the rear ranks did keep the men before them from running away. This is in part due to their physical presence as a barrier, but perhaps owes more to the psychological boost gained by the knowledge that your compatriots quite literally "have your back." I won't spend much effort on this argument, because it is quite weak. The author points to 18th century sergeants armed with anachronistic halberds and spontoons as a means of keeping the men of the battle line from fleeing- in armies that most surely did not push. Now, I am Greek and perhaps blinded by hellenophilia, but I have a hard time believing that, if we assume a 2 rank British line, it takes a rear rank depth of 6, 10, 14, or 48 hoplites to do the job of a single man with a Monty Pythonesque pointed-stick. The argument fails on the very universality from which it springs. Why should the Greeks alone require such a specialized formation to deal with a common problem? His better argument posits that the depth of the hoplite phalanx is based on the need to move large group of men in an orderly fashion. The basic argument is that a group of men of equal size can more more swiftly and in better order in a column than a line. This argument is a red herring though. Sure, a column of 10 files and 50 ranks will move better than a line of 50 files and 10 ranks. What he fails to address is that his scheme does not provide for deployment. Without deploying from column into line, he is facing the enemy with a 10 man front. It is not true that a column of 10 files and 50 ranks move better than a line of 10 files and 8 ranks. Thus we still need to explain the depth of ranks and for this we are back to his morale argument- or othismos as scrum. A second part of this argument is based on the fact that as formed men charged the ranks thinned out. He quotes Monteuccoli in his description of how men pull apart in the charge such that the actual number of men who reach the enemy at the same time is a fraction of the former front rank. In this argument Goldsworthy is failed by his understanding of crowd movements. He presents a picture of a column of men becoming "scattered" laterally as they advance. This is not what Monteuccoli was describing and in fact is the opposite of what occurs. 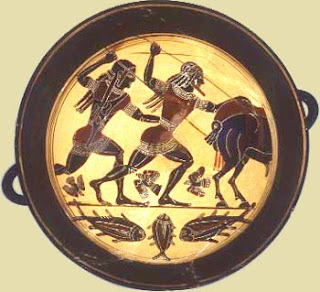 As any group of animals, hoplites included, run in a given direction, the faster/braver individuals pull ahead, while the others fall behind. The scatter occurs along the direction of the advance, not a fanning out sideways. Rather than fanning out, the group actually becomes tighter. The reason for this is the same morale effect that the author invokes elsewhere in his article. As the foremost men outpace those behind, the natural tendency is to move closer to the nearest man. This causes the group to narrow as it lengthens. This tendency is common to all herds. An interesting outgrowth of this is that we would predict that longer charges will actually make for narrower, deeper fronts if the men break ranks. We would expect the original 8 rank phalanx to be deeper and narrower unless the men kept formation through the charge. As I mentioned much of his other arguments are taken from earlier authors. 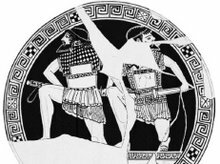 The notion that a hoplite could not use his weapons and engage in synaspismos is simply a misunderstanding of how such weapons were used and who the targets were. Yes, you cannot stab underhand at the man in front of you, but you can use the spear in your upraised arm quite effectively to stab beyond the man before you and you can use a short chopping or stabbing sword quite effectively. To learn more about my model of Othismos, you'll have to subscribe to Ancient Warfare magazine and get the third issue. I recently completed an article for "Ancient Warfare" on the hoplite shield and its application in my counter-reformative model of Othismos. Since it was only 2500 words, I have much I could not fit into the article. In the next few weeks I am going to disect Goldsworthy's 1997 paper and show why his model of othismos is in error. Just to be even I will also demonstrate that while correct in the general concept, Hanson et al. are mistaken in many of the details of how hoplites clashed.